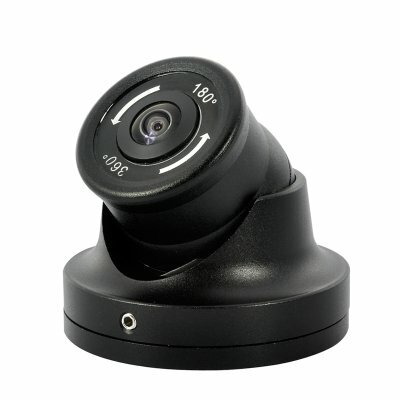 Successfully Added Mini Weatherproof Sony CCD Camera "Alfaview" - 360 Degree Viewing Angle, 600TVL to your Shopping Cart. This mini CCTV camera with 1/3 Sony CCD lens has a 360 degree viewing angle and can be installed discretely anywhere on your property. If you are looking for a discrete and convenient solution to improve the security of your home or office, look no further. This 360 degree camera is so small that it can be installed discretely anywhere you want. But don’t be deceived by the size of this camera, the “Alfaview” packs a 1/3 Sony CCD Lens and has a 360 degree viewing angle with a 600TVL resolution, so it's no slouch! Buying a new camera every year is just not an option and that’s why the “Alfaview” is designed with a durable weatherproof full metal frame to protect it from any damage. Aim the camera in any direction you want, hook it up to your DVR and your are ready to make your property more secure! So whether you need a discrete CCTV security camera for indoor use or if you are looking for a good outdoor camera, the “Alfaview” won’t let you down! Technology is always advancing and cameras are getting smaller and smaller. The “Alfaview” is one of the smallest cameras you can find on the market. So order one today and we guarantee to ship it out tomorrow. Brought to you by the leader in wholesale CCTV cameras, Chinavasion.